Design your own clothes using Zazzle! Zazzle is a web-business that enables people and companies (even big ones like Disney!) to design their own products with custom art, either for their own use or for resale. They and their customers can print the art on a variety of goods, from T-shirts to coffee cups to bags — even shoes! 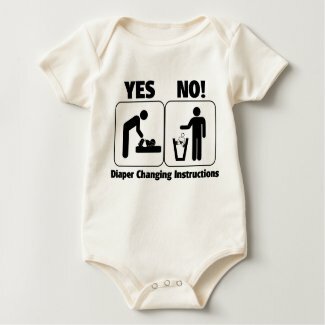 I was looking at their web site the other day and saw this “diaper changing instructions” design and laughed out loud. Simple, but it gets the point across. It’s a good use of their custom product manufacturing prowess. You can get it on a variety of kid and adult size clothes, even including baby onesies! This design might make a good humorous gift for a number of purposes. You’re trying to prepare your significant other for the idea of having (more) children. Your friends are going on their first post-birth date and you’d like to remind their baby-sitting teenager to change the baby’s diaper. You’re getting a divorce from a senseless dolt that doesn’t care about your children but falsely projects that you are the incompetent uncaring parent who doesn’t even change diapers. If so, let her (or him) know just how a baby’s diaper is changed by dressing the baby in a onesie with this design. Click on the diaper changing instructions baby onesie to the left to find out more about how to order this graphic on a product of your choice, including T-shirts and onesies for your children. The folks at teewitbaby who came up with with diaper changing instructions design have a number of other cute baby-oriented products. You can see a sample of some of them below.